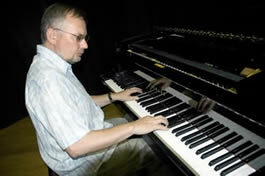 Lewis Riley has been a jazz musician and piano teacher based in Totnes for more than 25 years. He has also run jazz workshops across South Devon in schools, as evening classes or as part of the Dartington International Summer School, as well as running a jazz weekend every October at the Kingcombe Centre in Dorset. 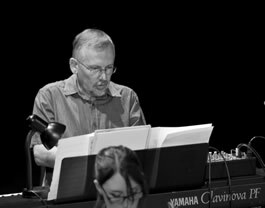 He was administrator and tutor for SaMS Saturday Music School at King Edward VI Community College (KEVICC) in Totnes for 5 to 18 year olds where he ran two jazz bands. He has played jazz in bands of varying sizes and in many contexts, from a trio to a quartet, quintet and a big band, playing his own compositions and arrangements, Latin jazz or the more standard jazz repertoire. In the 1980s he worked mainly in the Midlands with the band Pulse which featured the late trumpeter Harry Beckett and has toured throughout the South West with a sextet playing his own material and a quintet featuring vocalist Maggie Nicols. More recently he ran The Mother People, a nine piece band playing the music of Frank Zappa, which included his daughter Harriet on tuned percussion. Lewis also plays tabla, being a student of the late Ustad Latif Ahmed Khan of the Delhi garana, and has has worked in schools running workshops in Indian music as well as being influence by it in his compositions.